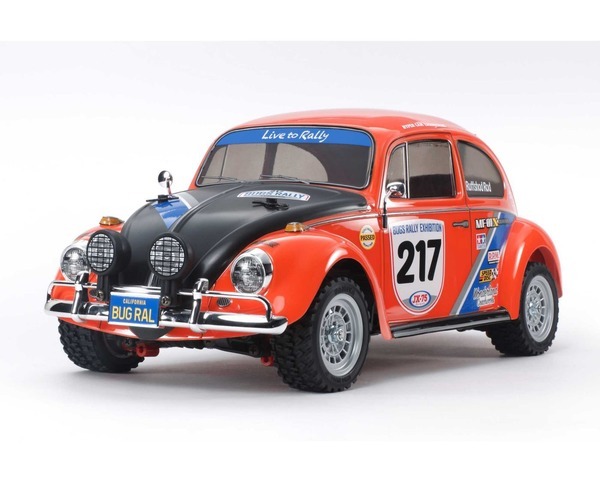 This R/C model assembly kit recreates the classic Volkswagen Beetle in rally racing form. Thanks to its superlative reliability and uncomplicated upkeep, it was a fixture on the global rally circuit from the 1950s through to the 1980s, and this model is inspired by such rallying Beetles. The VW body sits atop Tamiyas proven shaft-driven 4WD MF-01X chassis, which is at home on a range of surfaces from road to flat dirt.